Welcome to the unofficial home of Ontario’s Highway 11. Have you ever wondered what those dots on the map amount to? What are the towns like? What is there to see? Do some of these places even exist? Who lives there? Take a virtual town to town journey along Highway 11 from Barrie to Rainy River online at the unofficial homepage of Ontario’s Highway 11. Some call Ontairo's Highway 11 Canada’s Route 66. 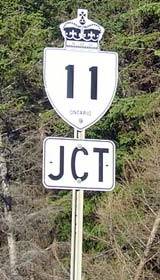 Others call Highway 11 Ontario the Transontario. The Guinness Book of World Records claims that Ontario Highway 11 is the world’s longest street. Running from Yonge Street in Toronto to Atwood Avenue in Rainy River, Highway 11 crosses Ontario like no other highway.